When I was pregnant with Corban, I kept dreaming about eating this soup. It was nothing I’d ever had before, simply the creation of a pregnant brain, recharging for a couple hours before waking me up for one of many middle of the night snacks (always accompanied by potty breaks of course). 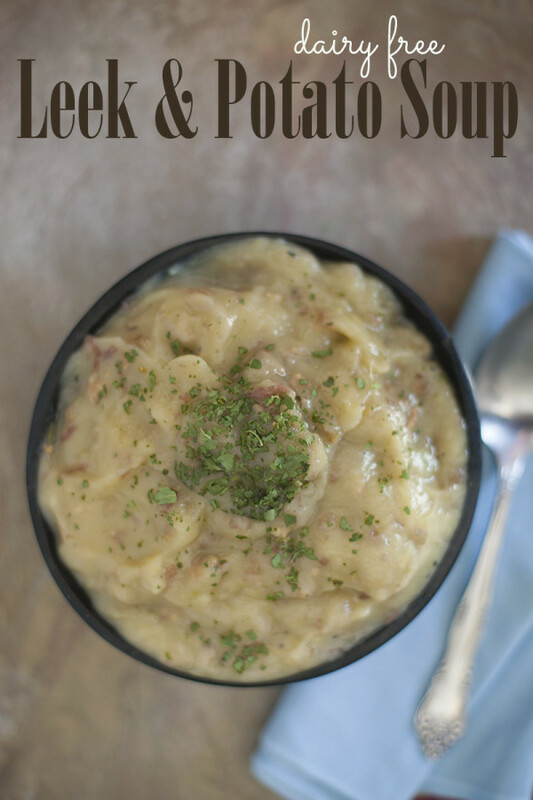 I kept having this dream about eating a rich and creamy potato soup, a blended soup (but with the potato skins left on for texture and nutrition, I still eat healthy in my dreams apparently) with hearty chunks of pork sausage stirred into it. For weeks I wanted to make this dream reality, but I barely cooked at all my final trimester. An eight hour work day felt like a 40 hour week, and all I could do was take a bath and try and get into bed for 10-12 hours, which meant I might get 4-5 hours of sleep! Once Corban was born, it was a few weeks before I felt up to cooking, but when I did, I once again felt the wonderful rush of envisioning a recipe in my head and then finding that reality tastes just as good if not better. This recipe uses my rosemary sage salt. Both herbs are fantastic with potatoes. If you don’t want to make the salt, you could substitute plain salt and then add fresh or dried herbs to taste. But I highly recommend making the salt, it’s easy people! I keep a jar by the stove and use it all the time. It makes a great gift as well. Leeks are usually very affordable this time of year, but onions are often even cheaper. If you can’t get a good deal on leeks, or are really tight on your food budget for the month, you can substitute a large yellow onion instead. If you do use leeks, make sure to save the dark green parts for stock. This is also a great freezer soup, it thaws so well and makes amazing leftovers. This was so much better than my dream about peanut butter and pineapple green beans (you don’t want to know). Have you ever had a food dream? Remove sausage meat from casings. Break up the meat and fry in a skillet until browned. 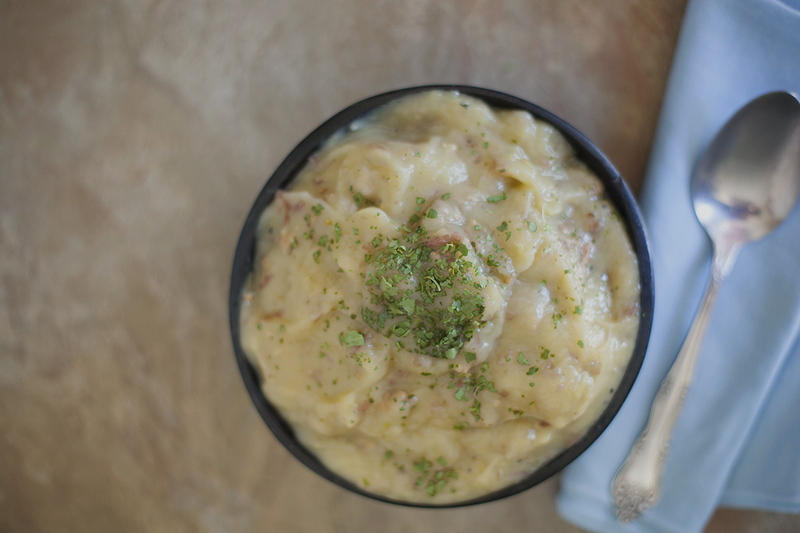 Cut the potatoes into large chunks (leave the peels, they’re good for you!). Put potatoes, leeks, and chicken stock into a large pot. Bring to a boil then simmer for 40 minutes until potatoes are completely soft. Use an immersion blender (careful not to splatter!) to blend the soup until smooth and creamy. Stir in the seasoning salt, pepper, and cooked sausage. Approximate cost/serving: This is a pretty cheap soup, especially if you make your own stock. We can get the potatoes, sausage, and stock (I often run out of homemade stock) in bulk at Costco. This cost us just around $4 to make the whole pot of soup, so about 50 cents a serving. Gluten Free: No changes necessary to make this gluten free, but make sure you get a good quality chicken stock that doesn’t contain hydrolyzed wheat gluten or MSG. I’ve made a similar dish, potato and leek soup from thekitchn.com’s recipe. I love how comforting this is and so cheap (even w/organic veggies). I like your idea of garnishing it w/herbs. Lovely. Excellent soup! The family loved it! I will definitely be making it again. The only thing I did differently was that I used spicy turkey sausage…gave the soup a little “bite”! Loved that it was non-dairy. That extra kick of spice sounds great Marsha. I’ll have to try that! Thanks for commenting and I look forward to hearing more from you in the future.